Whew, it's been quite a week and once again I've slipped into sub-par blogger status. Somehow 55-60 hours at the office in front of a computer ensuring that there are no glitches in the manual I'm working on doesn't make me super-excited to sit in front of a computer at home and spend another 2 hours blogging. I'm very relieved that the big push for my project is over and excited to return to my blog! One of the things I like to do at work when I need a bit of an eye-candy break from fixing invalid cross-references or shoddy index entries, or waiting for an extremely slow program to load, is online shopping and browsing some of the end-of-season sales. Yes, it's well into January and a lot of the good stuff is gone, but you'd be surprised at some of the sweet deals still left to be had. Another post-holiday sale cliche that is mostly true but not entirely is that all of the stuff that's marked down is overstock from the winter season. That means the best deals are on sweaters, flannel pajamas, wool coats, boots, scarves and gloves, and so on. As these three finds indicate, that's not always the case (thankfully). I came across this sweet cream-coloured patent leather heel on the Kitson website's exclusive sale. 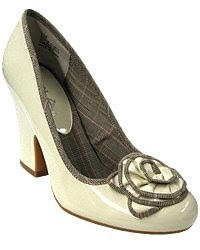 This shoe also comes in black, but imagine how lovely the cream-coloured shoe will look with the lighter, brighter colours of the spring season, and how demure the chunky heel and brown tweed-edged flower will be when paired with skirts! You can feel like Sarah Jessica Parker in that girly pink Gap commercial from a few years back, singing about how she loves being a girl when she has a brand-new hairdo and her eyelashes are all curled. My next find isn't quite as explicitly floral as the shoe, but it still gives off a very spring-like and feminine vibe. I love the classic shape and the idiosyncratic pattern and bead details. I also love the visions of this clutch paired with a white eyelet dress and a jean jacket that are dancing in my head. So lovely, classic, and chic. 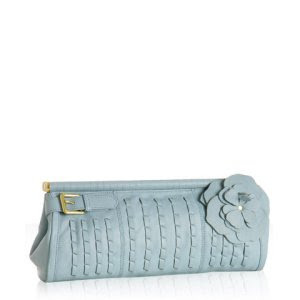 This clutch would also work with the aforementioned white eyelet dress and jean jacket outfit. But imagine it with a brown jersey halter dress, or maybe gray satin. I love how you always describe outfit pairings with your finds. Ooh, speaking of white eyelet dresses, I just so happened to see a bunch of shoulderless white eyelet dress in AE today! Ooh spring fashions are coming! !